Replace data_synchronizer_server with the IP address or DNS hostname of the Synchronizer server. 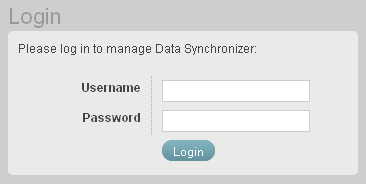 Specify the Synchronizer administrator user name (such as admin) and password that were established during installation, then click Login. The Monitor Connector should display a status of Running. If you cannot start the Monitor Connector by clicking (Start), refer to Section A.0, Mobility Connector Troubleshooting for assistance. For more information about Synchronizer Web Admin, see Configuring Synchronizer Web Admin in Synchronizer System Management in the Novell Data Synchronizer System Administration Guide.